Compare college tuition between 4 year private colleges, 4 year public colleges, and 2 year community colleges. Is it really cheaper to attend a public college or university? 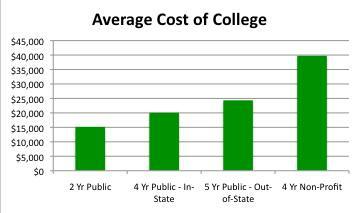 2 Year Public - The cost to attend a 2 year public community college is the least expensive option. Not only are tuition and fees cheaper, but room and board is cheaper, because it assumes the student lives at home with the parent. 4 Year Public In-State - An in-state public college or university is an affordable option, as the tuition and fees are lower for state residents. 4 Year Public Out-of-State - An out-of-state public school becomes more expensive, although there are regional Tuition Assistance Programs that offer reduced tuition rates for students from neighboring states. 4 Year Private, Non-Profit - On paper, private 4 year non-profit colleges and universities are the most expensive. However, many of them offer large financial aid packages that reduce the cost. It may also be easier to graduate within 4 years, reducing the overall cost (see below). Tuition and Fees Tuition and fees are set by the school, and may increase each year, especially for public schools. Tuition and fees may vary depending on how many units you take, and your major. For example, there may be lab fees for some art majors, or flying fees for aviation pilot majors. Room and Board - $7500 - $9000 a year. Whether you live in the dorm, an on-campus apartment, or an off-campus apartment or house, the cost for renting a room can be very expensive. Share a room to reduce costs if possible. Board means food. Meal plans vary in price, and usually they are required if you live in the dorm. If you live in an apartment or house, you can usually save money on food by shopping wisely and preparing your own food. 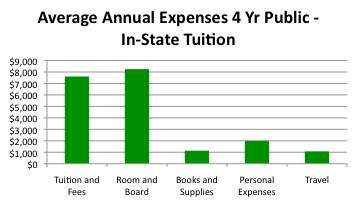 Books and Supplies - Average cost $1137 a year. Books and supplies can be very expensive, depending on your major. Check out ways to save money with Cheap College Books. Personal Expenses - Average cost $1989 per year. Laundry, cell phone, clothes, entertainment are all part of personal expenses. These are easy to go over budget. Why not get a student job for some spending money? Transportation - Average cost $1073 per year. Expect to pay more for travel expenses if you have a car, commute to college, or live across the country from your college. See our ideas for saving money on transportation costs with Student Travel Deals. Students with high GPA and test scores should definitely consider top private schools, as they can be very affordable. This is one of the best kept secrets - attending a 4 year private non-profit college or university can actually be cheaper! Private schools have several advantages. Graduate in 4 Years - First, students are more likely to graduate within 4 years. In public schools, it may be difficult to get the classes you need as many classes are impacted and are only offered once a year, so it may take 6 years to complete what you think is a 4 year degree. 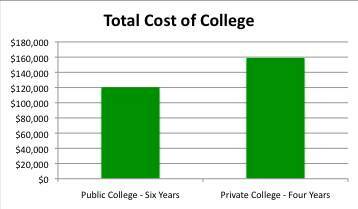 As shown in the above chart, 4 years at a private college is not much more expensive than 6 years at a public college. Good Financial Aid Packages - Second, many private colleges and universities have large endowments that are used for scholarships and grants for students who need financial aid. They may provide a better financial aid packet, so the expected family contribution is the same or less than a less expensive public school. Better Job Prospects - Third, a degree from a top rated private school may help a student secure that all-important first job out of college. Since most students graduate with some student loans, having a good job to allow you to pay back the loans is important. Click below to see submissions from other visitors about the cost of college tuition.